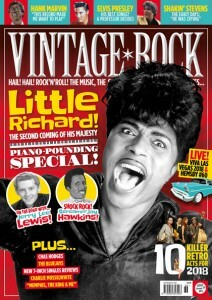 In the new issue of Vintage Rock we lift the lid on some of the greatest piano men in history, starring Little Richard and Jerry Lee Lewis. We also feature Elvis Presley, Hank Marvin, Shakin’ Stevens’ early years, the hottest new retro bands and much more. Little Richard – in an in-depth feature, Randy Fox looks back on King Richard’s second reign after his ‘comeback’ from the late 50s up to the 70s. Crazy tales and hidden gems await. Jerry Lee Lewis – in a Vintage Rock exclusive, Jerry Lee’s bassist/manager/cousin and father-in-law (!) JW Brown talks about the early days of the Ferriday Fireball, how the band cut Whole Lotta Shakin’ Going On, and what life was like on the road with one of rock’s most outrageous showmen. Screamin’ Jay Hawkins – we speak to Screamin’ Jay’s manager about the maverick’s latter day recordings, newly compiled on a fabulous CD, Are YOU One Of Jay’s Kids? Chas Hodges – much more than the ‘rockney’ piano-pumper in Chas & Dave, we speak to the ever-entertaining Hodges about his early days backing Jerry Lee Lewis, Gene Vincent and much more. We interview the author of Elvis: His 100 Finest Songs. Just how do you rate the crowning achievements of The King? Plus: read all about the making of Elvis masterpiece, Don’t Be Cruel. Shadows legend Hank Marvin is here – choosing the Soundtrack Of My Life which we guarantee contains a few surprises. We profile 10 of the hottest ‘new retro’ acts doing the business right now: whether straight-up rockabilly, 50s R&B with a twist, or surf guitar acts with a unique style. We also speak to The Bluejays, the brilliant young band taking 50s rock’n’roll hits on the road in a unique gig-meets-history-lesson. Plus, they tell how Buddy Holly’s wife Maria Elena ended up singing backing vocals for them! For our classic album, we speak to band-members involved in the rare Shakin’ Stevens & The Sunsets album A Legend. Not only the album is rare, so are our 1973 live photos of young Shakey – you can buy prints of those via www.popstockphoto.com. There’s a bumper section of live reviews this issue, with visits to both Hemsby #60 and the epic Viva Las Vegas headlined by the reunited Stray Cats, and in our music reviews there’s a new section devoted to cracking new 7-inch vinyl singles. Yep, vinyl’s back and it’s big, and Vintage Rock has the best rockin’ cuts recommended for your jukebox. Find this issue in WHSmiths, Eason’s and independent retailers. « Vintage Rock Presents – The Beatles, The Later Years!